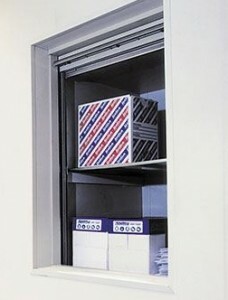 Document class microlifts are ideal for transportation of all maner of stationary or literature. Useful for businesses, large or small, allowing large quantities of paperwork and supplies to be transfered between departments, for work or filing. Also invaluable in large scale archiving for evvironement such as multi-story libraries. These lifts can quickly and easily transport books of all nature to their intended destination. These lifts save time and labour, while delivering important resources in perfect condition.